I know that I am among fellow cookbook addicts. Lynne Rossetto Kasper and Sally Swift's The Splendid Table's How to Eat Supper is one of my favorite cookbooks. It is filled with delicious recipes and sound advice. This weekend, I tried one of the pasta recipes that has just become one of my all time favorites. They write that the switching of the order of cheese and tomato sauce brings a whole new flavor to the dish. You have to give it a try. saute the bacon until golden. Remove and put on paper towels. Drain off all but 3 T of bacon fat. Saute the onions, s&P and red pepper flakes for about 5 - 8 mins until onions soften and start to color. Blend in the garlic and saute for one minute. Add the canned tomatoes (you could use fresh) crushing them. Add the bacon and bring to a lively bubble and cook for 8 minutes, stirring to keep from sticking. I used the immersion blender to smooth it out. Cook the pasta, when al dente, drain, turn it into a serving bowl and toss in the entire cup of cheese until mixed then toss with the sauce. It will be smokey smooth and delicious. Well, October's bread selections are up for The Mellow Baker's Challenge. I was hoping to end up with Normandy Apple Bread, it seems like a fall bread. Jeffrey Hamelman's Bread has so many intriguing recipes. And sooner or later, the Mellow Baker's will reach all of them. September's breads were a Cheese Bread, Sourdough with Walnuts and soft butter rolls. I made the soft butter rolls, the cheese bread and am mellowly skipping sourdough with walnuts. No one but me would be eating that one. October's breads will include pretzels, roasted potato bread and challah. If you bake bread a lot, you have favorite recipes. I really like the Bread Baker's Apprentice potato rosemary bread, we will have to see how Hamelman's recipe compares. The man can bake. I see challah and I think french toast. I am looking forward to baking that. I like braiding. The cheese bread was an interesting recipe. It stated with a stiff-levain build that stayed in the refrigerator for twelve hours. Then flour, water, olive oil, salt, and yeast were added to the levain. The cheese, which I grated, was added and the dough was fermented for 2.5 hours. It was shaped, fermented again and baked. I had a pretty slack dough. I wanted to slash it like Ostwestwind's loaf, who had one of the nicest looking loaves, but it was too slack. The good news is, it was delicious. 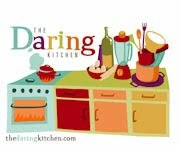 John from Eat4Fun came up with a fabulous challenge for September's Daring Cooks challenge. We were presented with two recipes, one for apple butter and one for bruschetta in a jar. The challenge was to try our hand at some canning, and include at least one of the recipes that he posted. I grew up in Pennsylvania and apple butter is a staple for the Pennsylvania Dutch. I am not Pennsylvania Dutch, they are of German descent, but in my college cottage cheese and apple butter were always on the salad bar. I prefer my apple butter with as few additional ingredients as possible. I used golden delicious apples, apple cider, and cinnamon. I cooked the apple until they were mush and then cooked them some more, eventually adding a little cinnamon. I ended up with a jar for the refrigerator and some bags for the freezer. I have had my eye on a jalapeno jelly. It calls for red peppers, green peppers, jalapenos, red wine vinegar, sugar and pectin. It is a simple recipe but makes two beautiful jars of jam. Wear gloves while you prepare the peppers. 6 tablespoons Certo liquid pectin. Combine the peppers, jalapenos, sugar, vinegar, and lime juice in a large sauce pan over medium heat. Heat until warm and sugar is dissolved. Pour the mixture in a blender or food processor and blend for 5 seconds. Return the blended mixture to the saucepan and bring to a boil. Skim off any foam that rises to the surface. Decrease the heat to low and simmer for 5 minutes. Stir in the pectin (follow the directions on the pectin for boiling time), increase the heat to medium-high and bring to a boil. Remove from heat and cool. The jelly will set as it cools down. When cool, cover and refrigerate for up to 5 days. I brought this into work and put it on cream cheese and served it with crackers. It was gone in minutes. I grew up helping my mother can. We canned whatever was available, peaches, apples, strawberries, tomatoes. It is a science, with set rules to keep everyone safe. John did a great job incorporating those rules in his post. It was a fun challenge, I wish that I had posted on time. We have an agreement in my house. We will all tighten our belts and avoid frivolous spending in an attempt to recover from our trip to Europe. Everyone thinks it would be a wise fiscal move. We appeared to all be in agreement. Unfortunately, I have an addiction to cookbooks. Generally, I can ignore them. I looked at a few cookbooks in a book store in Paris. Totally in French, using that wonderful metric system that I am trying to convince the United States to follow. And I was able to walk away. Pretty easily actually, since apparently although I can recall word for word some of my high school French lessons (Michelle and Anne watching TV instead of studying) I appear to have forgotten all the useful words. I am certain that I never knew the common recipe words. There are a few things that I tried in Paris that I would like to replicate at home. We had some wonderful mussels. Actually, any time they were on a menu, I ordered them. There were some that had been broiled in cream and perhaps leeks. They are on my to do list. I had a tart from the Salon de The that I must learn how to make. Visions of recipes were swirling in my head. And then when we returned, I learned that Dorie Greenspan's new book around my french table was available at Amazon.com I get Dorie's newsletter so I know that I like the way that she writes. I was tempted. I have seen the baked goods that the bloggers who are in Tuesdays with Dorie bake. They are consistently some of the most delicious looking sweets from Baking from My Home to Yours by Dorie Greenspan and if I was a baker, I'd be in the group. But my house is almost devoid of sweet teeth. Then, Gaarp at Of Cabbages & King Cakes wrote about Dorie's recipe for eggplant caviar. Who can resist eggplant? I just planted some lovely plants for our fall garden. What if I have no recipes when they are ready for harvest? So I bought the book, I caved, completely. To Gaarp's peer pressure. What a wonderful read. Far better than the material for my master's of nursing... I could spend the day reading the cookbook. I decided to try the recipe swap onion "carbonara." In my house, creamed onions are the sought after Thanksgiving side. These looked delicious. With onions, bacon, cream, egg, butter and Parmesan how could you go wrong? It is an easy recipe, that started with thinly sliced steamed onions. I have never steamed onions. Mixed with the bacon and the carbonara sauce they were delightful. I am so excited. It is a beautiful book, tempting recipes, I guess it isn't the worst addiction. I signed up to make the pita bread in the bread section of Nick Malgieri's The Modern Baker for the Modern Baker Challenge. I have made these pitas four times, but blogging has been the real challenge. It is the same excuse every time. I make these for dinner, I get picture of the process up to the end product. By the time we pull them out of the oven, I am putting things on the table. We sit, we laugh, we eat.... We eat them all before I photograph them. Today I decided to make these while I was alone in the house. Emily and Tom had to go to school early this morning for a mandatory meeting on going to college. No one was thrilled to leave the house on a Saturday morning. Maybe fresh pitas for lunch will perk them up. This is an easy recipe. The mis en place consists of flour, salt, warm water, olive oil and yeast. The salt and flour are combined, the yeast is mixed into the water and then the olive oil is added. The liquids are combined with the flour for two minutes and then the dough rests for 10 mins. The dough is kneaded for a few minutes, allowed to double then divided into 12 pieces. The pieces rest and then are rolled into rounds. The rounds rest and then are baked. I've made a batch of hummus and some tzatziki and everything is ready for lunch. I find that I need to add an extra 1/4 cup of flour to this recipe. I also find that sometimes my pitas puff and sometimes they don't. I don't exactly know why. But this recipe is a keeper. I have been a neglectful baker. All of my starters need attention. My cook books are lonely. My instant yeast is in the back of the refrigerator! The summer months were whirlwinds of activity. I took my girl scouts to New England, we came back, unpacked and then my family was back on a plane to Europe. The day after we came back, I went back to work. I work as a school nurse in a middle and high school that has a large number of kids with health issues. I like to have everything organized, a complete mis en place shall we say, for the school environment. Until that is accomplished, I feel unsettled. The good news is, things are getting organized. At home and school. All of my starters got some attention. They all still smelled quite delicious when I took them out of storage. I love the way starters smell. My liquid starter is quite perky. My stiff starter may need a little more tlc. My desk at work is organized. We have a three day weekend. Mellow bakers has three breads posted for September; cheese bread, soft butter rolls and sourdough rye with walnuts. The cheese bread and the sourdough rye need starters that haven't been languishing in the refrigerator. The butter rolls seemed perfect. My husband was making white chili and was willing to use the butter rolls instead of corned bread as an accompaniment. The dough came together quickly, flour, salt, sugar, yeast, egg, water, butter and dry milk. I use King Arthur's Baker's Special Dry Milk. It really think that it is better than my supermarket variety. I made the dough in my stand mixer. It fermented for a little more than an hour. I divided the dough into 24 and formed two pans full of rolls, they proofed for only a half an hour. I cut the baking time in half because Abby's were overcooked when she checked hers and I have been finding that my oven cooks faster than Mr. Hamelman's. After 15 minutes they were done. We enjoyed them. I have a favorite dinner roll recipe, that I got from Mags who got them from Frieda...Maybe some day I will have a bake off.